Packrat Video Games, LLC - Homebrew games for the Atari 2600, Odyssey2/Videopac, and Vectrex - Experienced, Dedicated, Passionate! in either NTSC or PAL. 100 total will be sold. A stand along cart and manual will be available as well. The	C7061 Game Selector is here! This is one of the best Odyssey2 / Videopac multi available. There is a backlog on this item, so it will take a bit of time to get new orders completed. It has been a long time coming, but it is finally here. Now available is a new Vectrex game, Asteroid Cowboy, by Andreas Bitter. This wonderful new game comes with a plastic box, insert, cartridge, and instruction manual. On There Way! - New Games! 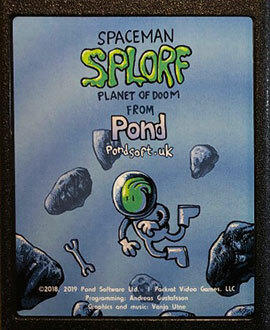 New 2600 and O2/VP game from Andreas Gustafsson (Spaceman Splorf) is in the works for late 2019, along with some re-releases of older games by Scott Dayton. For the O2/VP, Incoming from Ivan Machado will be coming out in 2019. Another game by Chris Read will be released in 2019 too, The 50-Foot Talk Stalk of Celery (after much delay on Packrat's side). For the Vectrex, Packrat is always looking for new games to release (contact us if you have one)! Packrat Video Games, LLC is a proud producer of quality Atari 2600, Odyssey2 and Vectrex homebrew games. Packrat also specializes in new classic video game merchandise, and is always looking for new projects! Packrat appreciates your patronage! Current Orders / Projects Status! As of April 17th, 2019, orders are being accepted again. It will take some time to get caught up with some orders. - Splorf orders will invoice and ship for the 2nd have of April. - The O2/VP Multi-cart backlog is now being worked on (finally). If you are waiting on an order, please check out the Order / Project Update page (which also lists the status of current projects). With new plastic boxes for the two newest Vectrex games (and more to come), shipping cost has remained the same for one game, but the packaging will be a bit different than it has been. This is needed to keep the weight at 8 or less ounces. More games (eventually all) for the Vectrex will use the new boxes. This will happen over many months.